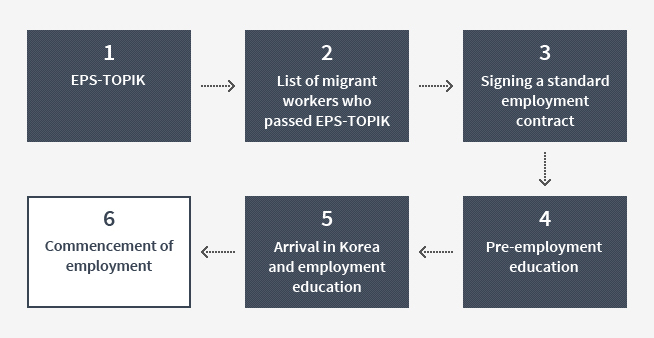 Since August 2005, the Human Resources Development Service of Korea (HRD) has administered the Employment Permit System-Test of Proficiency in Korean (EPS-TOPIK) to recruit migrant workers more fairly and transparently and to help them adapt to life in the country as quickly as possible. The HRD makes and manages the list of migrant workers who have passed EPS-TOPIK and applied for jobs after review to confirm that each of them meets the basic requirements. A Korean business selects a migrant worker introduced by the employment support center. The business selects an agent in a foreign country that will sign an employment contract on behalf of the worker. The relevant agency sends a standard employment contract to the worker-dispatching institution, which then checks whether the worker consents to the contents of the contract and sends the standard employment contract to Korea. ※ The Korean business (the employer) receives the standard employment contract taking over the worker. The migrant worker receives his/her portion of the standard employment contract from the worker-dispatching institution. The probation period is part of the employment period. Under The Labor Standards Act, the employer should treat both probationary workers and regular workers equally in terms of working conditions, excepting the minimum hourly wage. A probationary worker is paid a sum equal to 90% of the minimum hourly wage of regular workers. The employer is not allowed to lower the working conditions, including the wage, stipulated in the employment contract after the probation period. The HRD carries out pre-employment education for migrant workers who have signed an employment contract to help them adapt to the local situation in Korea as early as possible. The pre-employment education period lasts from one to 2.5 weeks, depending on the worker’s EPS-TOPIK score. igrant workers should obtain an E-9/Non-professional employment visa from the ROK Embassy in their country and leave for Korea under the guidance of the worker-dispatching institution. Upon arrival in Korea, they are obliged to attend a 16-hour (3-day) education session. Each migrant worker is taken by the future employer from the education facility, whereupon the term of employment commences. In principle, a migrant worker should continue to work at the agreed workplace. However, when it is judged that the normal employee-employer relationship is hard to maintain due to a problem with the employer, such as a delay of wage payment, the relevant worker will be allowed to transfer to another workplace for up to three occasions in connection with the need to protect the worker’s rights. Acts that hinder or interfere with the current status of employment of a migrant worker or his/her transfer to another workplace for a justifiable reason are punishable with imprisonment (with/without hard labor) for not longer than one year or with a fine not exceeding 10 million won. Upon termination of the employment relationship at the existing workplace, the migrant worker should submit the application for transfer to another workplace to the employment support center within one month of the end of the employment relationship and try to find another workplace with the help of the Center within 3 months. If he/she cannot find a new workplace within 3 months, he/she should leave the country.